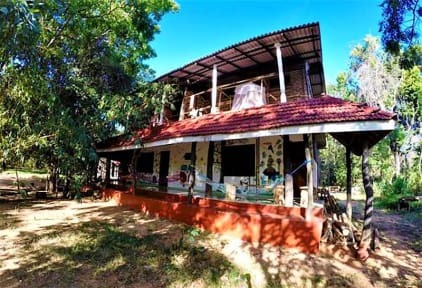 Jungle Vista Backpackers is set in Sigiriya in the Matale District Region, 9 km from Sigiriya Rock. The guest house has a sun terrace and a yoga school. Guests can enjoy a drink at the bar and delicious vegetarian food. Sleep in our beautiful open air dorm, amongst the treetops. Some rooms have a seating area, a terrace or balcony where you can chill out and enjoy the natural surroundings. Jungle Vista features free WiFi throughout the property and shared lounge & gardens to hang out with other guests and relax. Free private parking is available on site. Continental breakfast included. Smoothie bowls, pancakes and eggs made to order. Daily tours to local sites at reasonable rates, including: Lions Rock, Pidurangala Rock, Danbulla Cave Temples & Elephant Safaris. Transfers available, please contact us to arrange your pick up. You can play table tennis, take walks to the local lakes or try a yoga lesson. The area is popular for cycling. we offer bike hire. 1. Cancellation policy: Before 6.00 pm notice for free cancellation. 3. Check out before 4.00 pm.